Have you ever wondered privately what it might be like if the Jurassic Park franchise was thrown in a blender with The Hunger Games, but given a very small budget in order to make it happen? Probably not, but The Jurassic Games trailer is here to show you what that looks like. As it so happens, it looks exactly how you might expect it to look and, depending on your love for low-budget B-movie action, that is either going to be a great or terrible thing. This trailer, in a not at all surprising bit of convenient timing, just so happened to drop on the same day that the final trailer for Jurassic World: Fallen Kingdom arrived. Coincidence? Likely not. And if you're one of the people who just can't find a reason to get excited about a fifth Jurassic Park movie, this may serve as a schlocky substitute. 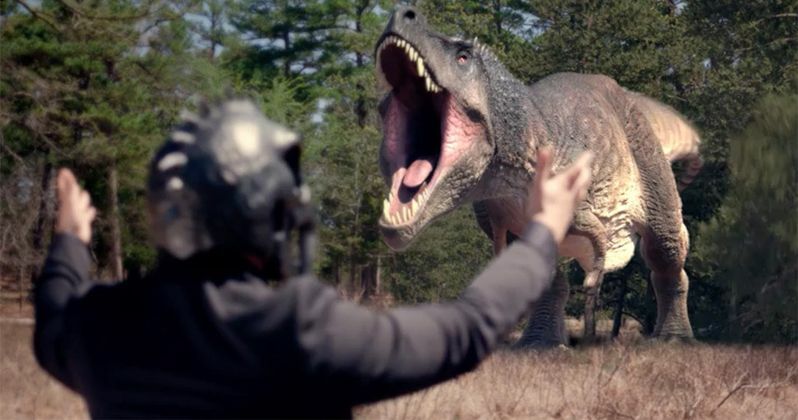 The Jurassic Games looks like it could be the guilty pleasure streaming movie of the year, assuming that the movie winds up on a major streaming service at some point. One can only hope, because does anyone really want to actually put up folding money for something like this? The movie takes place in a not-too-distant future that sees ten death row inmates compete in a virtual reality game show called, you guessed it, The Jurassic Games. They are forced to fight dinosaurs as well as each other in order to survive, because dying in the game means death in real life. Our protagonist is Anthony Tucker, a man who has been wrongfully convicted of murdering his wife. He can be reunited with his children if he wins, but unfortunately for him, that's easier said than done. The game's nefarious host adds increasingly difficult challenges for the contestants and, just like The Hunger Games, there can only be one winner. If anyone remembers the Gerard Butler movie Gamer, there are definitely elements of that thrown into the mix for good measure here as well. The Jurassic Games comes from writer/director Ryan Bellgardt, the man responsible for other such creations as Gremlin (not Gremlins) and Army of Frankensteins. So, for better or for worse, this seems to be right in his wheelhouse. The cast for the movie includes Adam Hampton (The Harvesters), Ryan Merriman (Final Destination 3) and Perrey Reeves (Old School). If you're looking to get your hands on the movie, Jurassic Games arrives on VOD platforms this summer on June 12. That just so happens to be a little more than a week ahead of the release of Jurassic World: Fallen Kingdom on June 22. If you're feeling like you need a hard copy of the movie for your collection, the DVD arrives on July 3. Sorry for those who were hoping to see this in Blu-ray quality. Be sure to check out the trailer for The Jurassic Games, courtesy of The Hollywood Reporter, for yourself below.